Or view larger version. 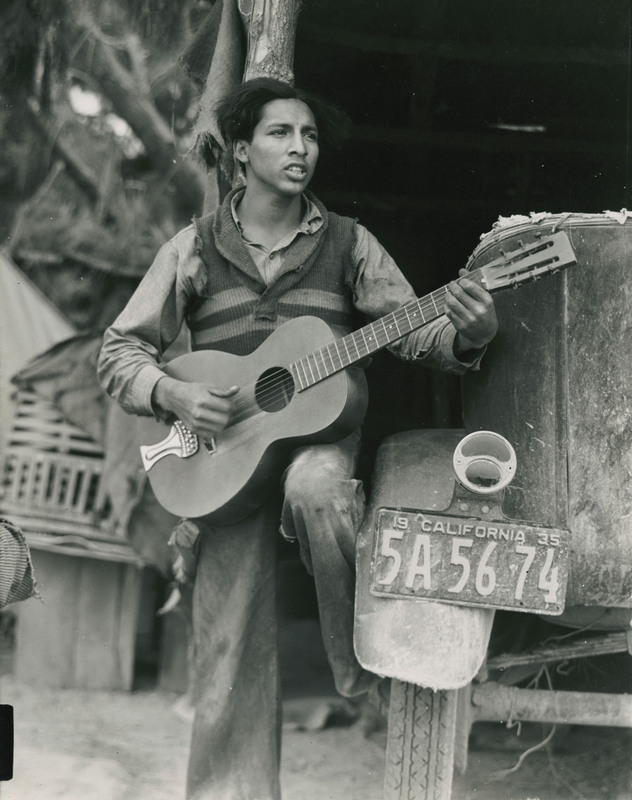 A young Mexican farm worker plays guitar and sings in a Coachella Valley labor camp. 1935. Dorothea Lange, photographer. Gelatin silver print. Collection of Oakland Museum of California. Gift of Paul S. Taylor. for lack of other food. and in a deplorable state." The corrido, or Mexican folk ballad, was and remains one of the strongest artistic expressions of Mexican culture. Through the corrido, day-to-day life could be made into art; all that was needed was a voice and maybe an instrument. Mexican and Mexican American migrant farm workers were often prevented by white law enforcement from entering "white" businesses or even from entering "white" towns, sometimes actually forced to remain on a farm owner's property until the harvest was completed. Partially as a result of this forced isolation, the Mexican and Mexican American farm workers retained strong ties to their Mexican roots.